On Sunday afternoon we decided to check out Alessi Woodstone Oven on N. Dale Mabry in Carrollwood for an early lunch. 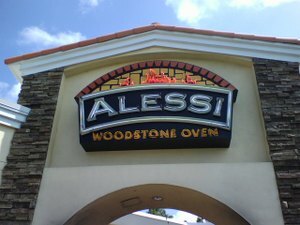 Alessi Woodstone Oven was opened last fall by Phil Alessi Jr., the son of Phil Alessi Sr., owner of the famous Alessi Bakery & Deli on West Cypress St.
Alessi Woodstone Oven's atmosphere and menu is across between chains Panera Bread and Maggiano's. Alessi Woodstone specializes in flatbread pizza (of course baked in a woodstone oven), pastas, paninis, salads and, as one would expect from the Alessi name, baked goods and dessert items. We arrived only a little after 11 am so the restaurant was just opening up. For our starter, we ordered fried mozzarella triangles. For my main dish I went with Maxine's salad, which is touted as Alessi's signature salad and includes avocado, gorgonzola cheese, raisins, diced chicken, cucumbers, olives and plantain chips. Traci ordered a custom 10 inch flat bread pizza with pepperoni, red pepper and sun-dried tomatoes. The server also brought out a complimentary garlic flat bread which was delicious. We are suckers for warm bread with olive oil to dip in and the Alessi mixed peppercorn grinder at our table made it even better. The mozzarella triangles were tasty and I particularly liked the shredded mozzarella that was sprinkled on top and around the plate. I wasn't as crazy about the marinara sauce for dipping. My salad was nicely presented and tasted even better. I had a few bites of Traci's flatbread pizza and we both agreed it was one of the better flat bread pizzas we've had. We were tempted to try one of the desserts, but we were already stuffed and had pizza left over to take home. Our server was friendly and attentive. Of course, the place was pretty empty so there wasn't competition for his attention. This was in stark contrast to the IHOP next door which had people waiting outside (a line for IHOP grub, huh?). I hope we just caught Alessi Woodstone at its slowest time because it was clearly hurting Sunday (granted it was before a Bucs game). I do wonder if the location (set back in a corner with limited visibility from Dale Mabry) is hurting it. The prices were also slightly higher than I expected, but then the food quality was better than I expected so this evened out. Overall, I had a good experience and hope they make it. Bottom-line: I don't know how Alessi Woodstone Oven performs when it's busy, but during our weekend visit we had a good experience and the food lived up to the Alessi name. Inspection Scorecard: Last Inspection - April 2006 - Critical (3), Non-Critical (2).